New Girl TV show on FOX. Max Greenfield, Hannah Simone, and Zooey Deschanel in the season five finale “Landing Gear.” ©2016 Fox Broadcasting Co. Cr: Adam Taylor/FOX. SPOILERS for New Girl‘s fifth season finale, “Landing Gear.” The episode just aired on FOX last night. Creator and showrunner Liz Meriwether spoke with The Hollywood Reporter about the future direction of the series and the eventual New Girl TV series finale. 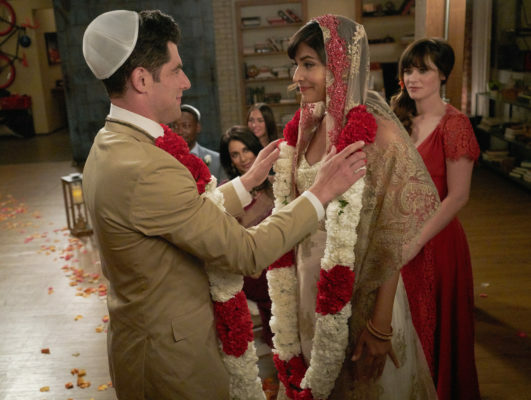 Last night’s “Landing Gear” features Schmidt (Max Greenfield) and Cece’s (Hannah Simone) wedding. While Jess (Zooey Deschanel) has been feeling those old feelings for Nick (Jake Johnson), he gets together with Reagan (Megan Fox). THR asked Meriwether about the New Girl season five finale, and talk turned to how she would like to end the series. Check it out. You wrote the finale before the renewal, but did you know it was coming? After 116 episodes, how do you feel about the lifespan of the show? That’s a lot of episodes. I love working on the show. It’s been such an amazing joy. I think i’ll start working on some other things next year as well, and I’m excited to start doing that. I now think it’s possible to do both, and that’s what I plan on doing next year. Do you have an idea of how you’d like the last episode to look? I’ve never been somebody to plan everything out. With Zooey’s pregnancy, with losing Damon [Wayans Jr.], I think it’s better to go into a show not saying, “This is what’s going to happen.” Because we never know. I’ve always tried to stay in tune with what’s happening on set. I like to be open to what’s working there. That said, we knew Schmidt and Cece would get engaged last season and married this season. There are always big things we’re working towards. But in terms of the end of the series? I don’t know. It’s sort of hard to think about it. We’ll figure it out when we get there, but I might sort of disappear for a month in the Canadian wilderness for a month. How did you like last night’s season finale? What do you want to see happen in the New Girl TV show finale? Let us know, below. More about: New Girl, New Girl: canceled or renewed?